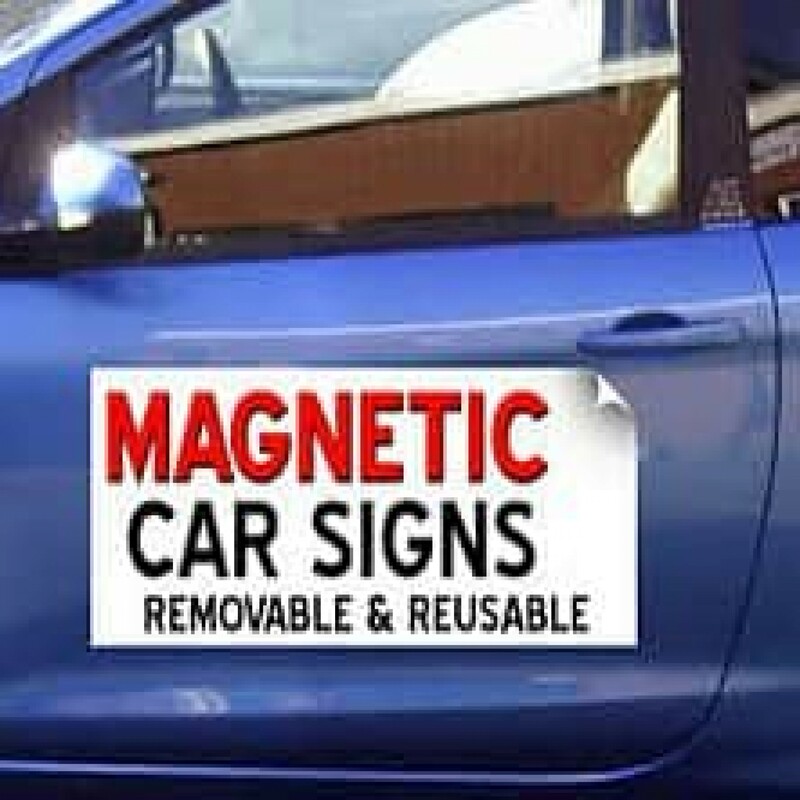 Magnetic signs turn your vehicle into a moving billboard. Advertise your business or special events wherever you go. Great on pickup trucks and tailgates. Easy to remove and reuse over and over. We use only the highest quality materials on all jobs. Standard sizes are 12x24 inches, 18x24 inches. We can custom cut to any shape and size. Please select a size below and start customizing! You can CHANGE EVERYTHING from the background color, text style, size and color. Add outlines and shadows. Upload logos and even photographs. All orders are shipped the NEXT business day. Which Size Car Magnet is right for you? Choose a template or upload your own design on our durable truck magnets. These 12"x24" removable magnets fit great on your truck doors or tailgate. Get your business noticed by everyone with a durable magnetic sign for your truck. Whether you’re advertising your business or planning a wedding, car door magnets are sure to make a statement. Our bulk quantity discount makes magnetic car door signs perfect for your restaurant's delivery drivers or your campaign supporters. The last signs we ordered from another company fell apart after a couple hot summer days and some hand car washes. Since I shopped at Custom Online Sign before, I knew the magnetic signs would be great looking and they won’t blow off when you’re driving. Since signage is one of the most important things about advertising your business, it makes good sense to buy quality signage. Which is why I shop at Custom Online Sign. Vehicle magnets are available in durable .030 or premium .045 magnetic material. All magnetic signs have rounded corners to ensure your message stays put. Simply place your magnets on a clean metal surface and you can easily remove and reapply your magnets over and over. Read more about Taking Care of your Car Magnets. Customize your magnets using our free templates or design your own message from scratch. Display your logo, phone number, website address and anything else you like everyone you pass. Both standard and premium magnets are removable so you may stop advertising anytime you like. Order your vehicle magnets today! Take your message on the road with our custom car magnets for your business or event! Hey businesses! Need magnetic signs for trucks, cars or vans that represent your company? Our removable and re-positionable magnetic signs are the easy solution for switching advertising on your company cars and fleet vehicles from vehicle to vehicle! Check out our Business Owner’s Guide to Vehicle Signs. Personalize your car magnet with your company's logo, website, and contact information to create a business magnet that stands out on your car door, truck tailgate, or van exterior! Has a team or milestone to boast? Create a custom car door magnet personalized for your sports team or upcoming event! Start designing your custom magnetic car signs with our easy to use online design tool and enjoy free standard shipping on your custom car magnets.